Sylvester and the Magic Pebble on TheBookSeekers. One rainy day, Sylvester finds a magic pebble that can make wishes come true. But when a lion frightens him on his way home, Sylvester makes a wish that brings unexpected results. How Sylvester is eventually reunited with his loving family and restored to his own donkey self makes a story that is beautifully tender and perfectly joyful. Illustrated with William Steig's glowing pictures, this winner of the 1970 Caldecott Medal is a modern classic beloved by children everywhere. Now reissued to celebrate the discovery of the original artwork, this deluxe edition contains painstakingly careful color corrections made from those watercolor originals -- the color you'll see within this book is as Mr. Steig had originally intended it to be. It also features his moving Caldecott Medal acceptance speech. 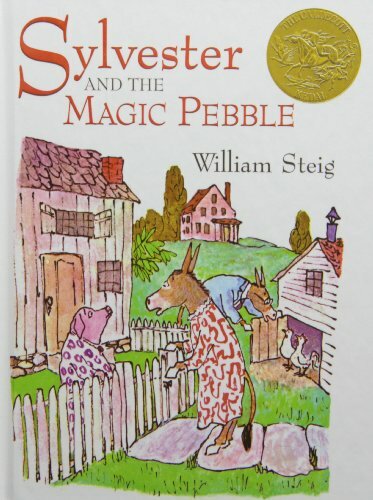 The New York Times Book Review wrote of Mr. Steig that ""everything he does is magic."" This deluxe edition of Sylvester and the Magic Pebble truly recaptures that magic for a whole new generation of readers.